A tasty theme for modern restaurant. The abundance of quality images and bright colors stimulate visitors' appetite. Two sliders help to save space on the page. White background makes the photos look even more appealing. Colored blocks under the bigger slider boost cafe and restaurant WP template navigation. 'Welcome' and 'Latest news' sections are clearly readable at the center of the page. 'Our team' section includes restaurant staff photos. The theme is responsive and crossbrowser compatible which makes UX equally good on all modern gadgets. Moreover, built-in Google map lets the guests quickly find restaurant location. 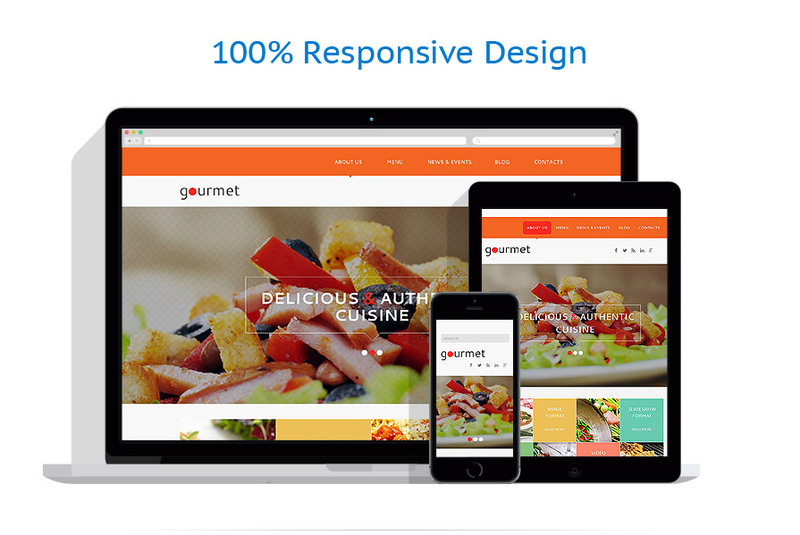 The template was created for food drink, cafe restaurant, travel, holiday websites. Info is available via Live Chat. WordPress is the world’s most used CMS, and rightfully so. It's ridiculous how easy it is to use and customize a WordPress-powered website. If you are one of the millions of WordPress admirers and looking for a modern WP theme for your online business - you've come to the right place. All our WordPress themes are pretty easy to install, customize and update, all of them are fully responsive and cross-browser compatible.